Diane Silverman of the Kingman Visitor Center just dropped by to tell me that one of the five new postcards created by Dan "The Man" Harshberger is outselling all the other postcards. She thinks it's the colors. 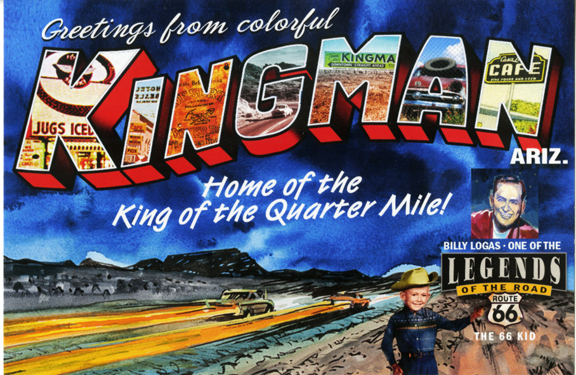 Kingman postcard: "Billy Logas king of the Quarter Mile"
Nice to see that Billy Logas is getting the exposure. "The 413 is really diggin' in. . .tack it up, tack it up, buddy gonna shut you down."